A stroke, or cerebral vascular incident (CVA), is an abnormal condition of the brain characterized by occlusion by an embolus, thrombus, or cerebrovascular hemorrhage or vasospasm, resulting in ischemia of the brain tissues normally perfused by the damaged vessels. The sequalae of a CVA depend on the location and extent of ischemia. It is the most common and lethal neurological disorder, and the number one cause of disability in adults. The primary cause of stroke is cerebrovascular disease caused by one of several pathologic processes involving the blood vessels of the brain and often occurs in well-appearing adults. On average, the incidence rate of first strokes is 114 per 100,000 persons, which accounts for 750,000 first strokes in the USA each year. Risk factors for stroke include: family history, age >55 years old, hypertension, high cholesterol, cigarette smoking, diabetes, obesity, cardiovascular disease, previous history of stroke or TIA, high levels of homocysteine, and use of birth control or other hormone therapies. The early clinical manifestations of stroke include: sudden weakness or numbness of the face, arm, or leg; sudden dimness or loss of vision, particularly in one eye; sudden difficulty speaking or understanding speech; sudden severe headache with no known cause; unexplained dizziness, unsteadiness, or sudden falls. The two types of stroke include ischemic and hemorrhagic, with ischemic stroke accounting for 83% of all cases. This review shall take a closer look at the cellular mechanisms that occur after the most common of these two types: the ischemic stroke. When brain cells are deprived of sufficient oxygen after an ischemic stroke, a biochemical cascade is initiated, involving several pathways known as the ischemic cascade, leading toward cell death, including excitotoxicity, oxidative stress, and apoptosis. Average blood flow in the brain is 58ml/100g brain weight per minute. At 30 ml/100 g, neuronal dysfunction begins to occur and at 12 ml/100 mg cell death begins to occur. Glutamate is the main excitatory neurotransmitter throughout the central nervous system. Glutamate, a dicarboxylic amino acid, requires ATP initiated active transport to initiate re-uptake after being released from a cell. During ischemic conditions, glutamate is released from the cell with decreased reuptake. In the ischemic zone of injury, glutamate levels can reach approximately 80 times their baseline levels. In the penumbra, this level is lower, but still produces a neurotoxic effect in the region which can lead to cell death. It was previously thought that elevation of glutamate levels was a transient event, lasting only 1-2 hours after initial ischemia, but in human model experiments, this increased glutamate level has been recorded for up to 4 days after an ischemic event. In the ischemic zone, the glutamate binds to postsynaptic receptors which triggers increased calcium influx through glutamate receptor-coupled ion channels. Glutamate overstimulates receptors including N-methyl-D-aspartate (NMDA), alpha-amino-3-hydroxy-5-methyl-4-isoxazolepropionic acid (AMPA), and kainite-type glutamate receptors, leading to sodium influx and potassium efflux through the glutamate receptor activated membrane channels. NMDA channels are highly permeable to calcium and contribute to the influx of calcium into the cell. Receptors trigger influx of calcium from extracellular and intracellular locations, but it is the influx of calcium from the extracellular fluid that is thought to be the primary factor in calcium contributory mechanisms of cell death after ischemic stroke. Figure 1: Role of glutamate in cell death following ischemic stroke. Under certain circumstances, the potassium efflux through the NMDA channels and other ion imbalances can trigger increase caspase activity, triggering apoptosis. The primary caspases responsible for apoptosis due to ischemic stroke are caspases 9 and 3. Caspase 9 is responsible for the downstream triggering of caspase 3 which, when activated, begin to degrade substrate proteins within the cell and produce internucleosomal endonuclease activity and DNA fragmentation. Caspases also cleave homeostatic, cytoskeletal, DNA repair, metabolic and cell signaling proteins, further leading to cell death by apoptosis. Early after the initiation of ischemia in a cell, there is increased expression of proinflammatory genes such as NF-kB and interferon 1b. These genes increase the activation of production of factors such as platelet activation factor and tumor necrosis factor which initiate a cascade which leads to increased expression of adhesion molecules, and increased levels of leukocytes, neutrophils, macrophages and monocytes. This inflammation can have a destructive effect on the cell by impairing microcurculation of small vessels through leukocyte plugging and increases in toxic enzymes such as NO synthase. 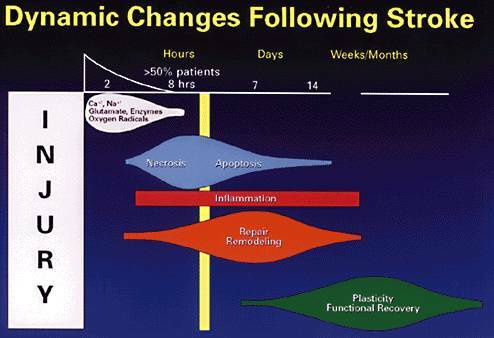 Figure 2: Timeline of dynamic changes following a stroke. While these mechanisms have primarily been studied in the neurons of the brain due to their metabolic and functional activity levels and high energy demands, the surrounding structural cells, such as glial cells, are also effected by ischemia. Neuronal division of energy expenditure is divided approximately equally between axoplasmic transport, ion pumping, and protein synthesis. Glial cells do not require energy for axoplasmic transport, but do require energy for ion pumping and protein synthesis. Astrocytes, a type of glial cell which assists in regulation of the extracellular space, demonstrate ionic currents and cell-surface receptors for glutamate making susceptible to similar mechanisms of cell death as effect neural cells. While many of the cellular factors activated during ischemia contribute to the death of the cell, other components triggered are designed to protect and preserve the cell, slowing or preventing cell death during periods of ischemia. Glutamate receptor activation also links with the cell’s stress responses, which can reduce cell damage during stress. NMDA receptor activation initiates Ras-GRF exchange factors, up-regulating ERK and CREB pathways. Double knockout mice without Ras-GRF1 and Ras-GRF2, demonstrated increased damage to cells after ischemic injury compared to mice with these exchange factors. Adenosine, a neurotransmitter, accumulates in the cell due to breakdown of ATP. Activation of adenosine receptors can reduce neurotransmitter release and membrane excitability, slowing cellular deterioration. No single mechanism can be identified as the single key factor leading to cell death after ischemic stroke. It is the involvement and interaction of many different pathways within the cascade of events that produces the end result of either cell death or cell recovery after the trauma of ischemic stroke. Some of these mechanisms will be individually examined for a more detailed look at their key roles in this process in the following sections. Following severe ischemic injury to the cell, there is a loss in mitochondrial membrane potential . This leads to swelling and eventual collapse of the inner and outer mitochondrial membranes, and inability to conduct oxidative phosphorylation . Because of this, cell death by necrosis occurs. The opening of the mitochondrial permeability transition pore triggers necrosis, and may also lead to apoptosis by releasing mitochondrial contents, including cytochrome c, into the cytoplasm of the cell . Excitotoxicity is the pathological process by which neurons are damaged and killed by the overreactions of receptors for the excitatory neurotransmitter glutamate, such as the NMDA receptor and AMPA receptor. In classical excitotoxicity, elevated levels of extracellular glutamic acid cause persistent depolarization of the neuron. This triggers a cascade of cellular events that eventually lead to cell death. Three elements of this cascade can be identified: events depending on sodium influx, events depending on calcium influx, and events depending on exocytosis of glutamic acid. In stroke, Excitotoxicity is a determining factor in the extent of the resulting lesion. Following a stroke, there is a disruption of ionic gradients across membranes. This disruption causes an increase in extracellular K+ and an influx of Na+, Cl- and Ca2+ in the cell. The extracellular K+ triggers depolarization and reversal of the amino acid transporters which activates Ca2+ channels, leading to an elevation of free cystolic Ca2+. A massive release of glutamate also results. The binding of glutamate to NMDA promotes excessive Ca2+ influx which triggers a range of downstream phospholipases and proteases that degrade membranes and proteins which in turn compromises cellular integrity. In addition, high intracellular Ca2+ levels cause mitochondrial Ca2+ overload, inhibition of ATP production, and huge breakdown of phospholipids, proteins, and nucleic acids by activation of Ca2+-dependent phospholipases, proteases, and endonucleases. Finally, glutamate receptors promote an excessive influx of Na+ leading to cell swelling and edema thus propagating excitotoxicity. Figure 3: Example of an NMDA receptor. When glutamate binds to this receptor, it promotes the excessive influx of Ca2+ and Na+ into the cell which eventually leads to cell death. Acidosis is a condition in which there is excessive acid in the body fluids. Acidosis is a common feature of brain ischemia, where low pH is assumed to play an important role in the pathological process. Activation of Ca2+ permeable acid-sensing ion channels (ASICS), has been shown to be responsible for acidosis-mediated , glutamate receptor- independent, ischemic brain injury. The above research on excitotoxicity and acidosis may indicate that combined inhibition of both glutamate-mediated exicitoxicity and ASIC1a-mediated acidosis may prove to be a new and useful neuroprotective strategy for stroke patients. Apoptosis is a form of programmed cell death, which involves features including shrinkage of the cell cytoplasm, cleavage of DNA within the nucleus, condensation of chromatin in the nucleus, and formation of apoptotic bodies, which eventually leads to death of the cell  . During normal development, apoptosis is the main form of cell death  . However, this has also been well-documented following cerebral ischemia  . The regulation of apoptosis is largely controlled by mitochondria, which are responsible for the movement of proteins across mitochondrial membranes  . There are a number of potential pathways for apoptosis to occur, including intrinsic and extrinsic methods  . With few exceptions, apoptosis in mammals depends on activity of caspases . Caspases (cysteine aspartate-specific proteases) are enzymes involved in either the initiation or execution of apoptosis . There are 14 different types of caspases, found in nearly all cell types . The caspase family is divided into types that are activated during apoptosis (-2, -3, and -6 through 9) or secondary to an inflammatory response (-1, -4, and -5) . These can be further divided into initiators (caspase -8, -9, and -10) and executors (caspase-3, and -7) . Initiator caspases cleave inactive aspects from other caspases, activating them . Executor caspases cleave other proteins within the cell to begin apoptosis . The Bcl-2 family of proteins are also critical in the regulation of intracellular apoptosis. These proteins include anti-apoptotic (Bcl-2, Bcl-xL, and Bcl-w) and pro-apoptotic (Bax, Bak, and Bad) groups. The anti-apoptotic members are localized in the outer mitochondrial membrane and research has shown that these are important for maintaining neuronal survival . The pro-apoptotic members, on the other hand, have been shown to be crucial for neuronal cell death induced by trophic factor withdrawal and injury . Death signals can be initiated intracellularly by a number of factors, including mitochondria, damaged DNA, or the endoplasmic reticulum . Using intrinsic signaling including a translocation of pro-apoptotic Bcl-2 members like Bax into the mitochondria, a cascade of events are triggered . In the mitochondria-mediated pathway, this leads to mitochondria releasing substances such as cytochrome c, procaspase-9, and Apaf-1 from its intermembrane space . Cytochrome c is able to bind to Apaf-1 when in the presence of dATP or ATP to form an “apoptosome” . This apoptosome is able to activate procaspase-9, which in tern activates executor caspase-3 . Neurons can still survive following the release of cytochrome c if apoptosis inhibitor proteins (IAP, NAIP, XIAP, and survivin) are able to bind to caspases and prevent them from becoming active. However, these apoptosis inhibitor proteins, can also be deactivated by the mitochondrial protein Smac/DIABLO, which binds to them and promotes apoptosis  . Apoptosis-inducing factor (AIF) can also be released from the mitochondrial inner membrane . AIF is responsible for chromatin condensation and DNA fragmentation . AIF translocates from the mitochondria to the cell nucleus and is triggered by the enzyme PARP-1 following damage to DNA . Following cellular stress including glucose deprivation, depletion of calcium, exposure to free radicals, and accumulation of unfolded or misfolded proteins, the ER initiates unfolded protein response (UPR) . During this UPR, three ER transmembrane effector proteins are activated (PERK, IRE1, and ATF-6). IRE1 has been shown to be involved in the activation of caspase-12 . At the present time, the exact mechanisms of this form of apoptosis is poorly understood, although it has been suggested as a mechanism of neuronal cell death following ischemia . In this mechanism, engagement of death receptors located in the plasma membrane is triggered. These receptors are referred to as tumor necrosis factor receptors (TNFR) and include TNFR-1, Fas, and p75 . A transcription factor, Forkhead1, stimulates the expression of genes including Fas ligand (FasL) . FasL initiates apoptosis by binding to the Fas receptor and recruiting the Fas-associated death domain protein (FADD) . This protein binds to procaspase-8 and forms the death-inducing signaling complex (DISC), made up of FasL, Fas, FADD, and procaspase-8 . Proteolytic cleavage occurs and caspase-8 is generated . Caspase-8 then directly cleaves and activates caspase-3, beginning the apoptotic signal for cell death . Also, once caspase-3 has become activated, it may cleave procaspase-8 and increase the process of cell death . Extrinsic cell death can also involve the mitochondrial pathway using an intermediate Bid . In this combination of the two pathways, Bid is cleaved by caspase-8 to form tBid, which is then translocated to the mitochondria . This begins the intrinsic pathway. Figure 4: Summary of the extrinsic and intrinsic apoptotic pathways. A potential pathway for cellular damage in ischemic stroke may be the occurence of oxidative stress, which is the increased occurrence of reactive oxygen species (ROS) above physiological levels. Oxidative stress has been suggested for many years to cause tissue damage and neuronal death. ROS are also known as free radicals. Free radicals can cause membrane damage through peroxidation of unsaturated fatty acids in the phospholipids making up the cell membrane. They can also cause damage to fundamental cellular components such as nucleic acid lesions, gene damage, and gene repair activity, leading to subsequent cell death by necrotic or apoptotic mode. The ROS particularly responsible in oxidative stress are nitric oxide (NO) and superoxide radical anion (O2-). The toxicity of ROS can be farther increased by the reaction between the two ROS to form peroxynitrite (ONOO-), a molecule that causes oxidation and nitration of tyrosine residues on proteins. Other improtant oxidant species are hydrogen peroxide (H2O2) and the hydroxyl free radical (*OH). Under normal physiologic conditions, ROS are produced at low levels and are controlled by endogenous antioxidant systems that include superoxide dismutase (SOD), glutathione peroxidase, catalase, and antioxidant vitamins. However, harmful effects in the brain take place when the generation of ROS overwhelms the endogenous antioxidant systems, causing cellular damage. After ischemia and reperfusion, the overwhelming amount of ROS lead to harmful effects, such as: damage of membrane lipids, peroxidation of docosahexaenoic acid, cleavage of DNA during the hydroxylation of guanine, and methylation of cytosine. ROS can also block mitochondrial respiration by inhibiting complex enzymes involved in the electron transport chain. After ischemia and reperfusion, oxidative stress facilitates mitochondrial transition pore formation, which causes increased release of iner and outer mitochondrial membrane space constituents including apoptosis-related proteins. Endoplasmic reticulum is also susceptible to oxidative stress, which may be implicated in neuronal cell death after cerebral ischemia. Figure 5: Production of the hydroxyl and peroxynitrite free radicals and their effects on the cell. ROS acitvate various cell signaling pathways and many transcription factors that are proposed to be involved in regulating cell survival/death. Targeting oxidative stress proteins may provide beneficial therapeutic intervention to successfully combat ischemia and reperfusion. Some possible solutions include the use of antioxidant enzymes that fight against apoptosis, administration of fusion proteins intravenously, and the use of melatonin, which has been shown to prevent neuronal loss in experimental models of ischemia. It should be of note that oxidative damage does not occur alone, but participates in the complex interplay between excitotoxicity, apoptosis, and inflammation associated with stroke. Because of this complex interplay leading to cell death, effective strategies for the prevention and/or treatment of ischemic brain injury is likely to require intervention at multiple mechanisms. Ischemia induced NO overproduction is partially caused by an increase in glutamate-mediated intracellular calcium concentration, resulting in a calmodulin-dependent upregulation of nitric oxide synthase (NOS). NOS family includes NOS1-NOS3. Cerebral ischemia causes a surge in NOS1 activity in neurons, and possibly in glia also, and thought to be secondary to reversal of glutamate reuptake at synapses, activation of NMDA receptors, and resulting elevation of intracellular calcium. While on the other hand, increased NOS3 activity in the vascular endothelium and an increase in NOS2 activity in ischemic brain tissue probably derive from from a range of infiltrating neutophils, macrophages, activated microglias, and astrocytes. The activity of all three forms of NOS have been reported to increase after ischemia and reperfusion. The activity of NOS1 and NOS2 can cause much harm after ischemia and reperfusion, and the inactivation of of them is neuroprotective. A potential source of ROS are NADPH oxidases, the only known enzyme family that is only dedicated to ROS production. Four rodent genes of the catalytic subunit NOX, Nox1, Nox2, Nox3, and Nox4, have been identified, of which Nox1, Nox2, and Nox4 are expressed in the vasculature. Nox4 is the most abundant vascular isoform, with its expression even higher in cerebral than in peripheral blood vessels and further induced in stroke. One study in particular has shown that Nox4 is induced in ischemic stroke in both mice and human models. The Nox4-mediated oxidative stress leads to neuronal damage via leakage of the blood-brain barrier and neuronal apoptosis- two common markers of ischemic stroke. The hypothalamic-pituitary-adrenal or HPA axis is a component of the neuroendocrine system that responds to stress . The stress response is coordinated by neurons in the paraventricular nucleus (PVN) of the hypothalamus, corticotopin-releasing hormone (CRH) neurons of the medulla, and neurons of the locus coeruleus/norepinephrine (LC/NE) system composed of the LC and noradrenergic cell groups of the medulla and pons. The LC/NE system controls the stress-induced stimulation of the sympathetic nervous system resulting in a release of NE (a catecholamine) throughout the body. Increased NE contributes to increases in the autonomic and neuroendocrine stress response including activation of the HPA axis . Stress also facilitates an increase in the release of CRH from the PVN and CRH neurons of the medulla. CRH functions to activate the sympathetic nervous system via the LC/NE system and leads to increased adrenocorticotropic hormone (ACTH) secretion. ACTH induces the secretion of glucocorticoids which suppress pro-inflammatory mediators, facilitate anti-inflammatory mediators, and play a key role in the regulation of the HPA axis and the body’s response to stress . Glucocorticoids, including cortisol, exert negative feedback on ACTH secretion, hypothalamic CRH neurons, and the LC/NE system thereby limiting tissue exposure to glucocorticoids which minimizes the catabolic, lipogenic, antireproductive, and immunosuppressive effects of these hormones . General functions of the principal hormones involved in the stress response are summarized in Table 1. Table 1: Hormones of the stress response. Cortisol Cortisol is the primary glucocorticoid released from the adrenal cortex. It has multiple functions but primarily acts to regulate the metabolism of proteins, carbohydrates, and lipids . Cortisol can have pro-inflammatory or anti-inflammatory effects based on the duration of exposure, magnitude of exposure, and timing of the exposure . Cortisol also decreases immune function by decreasing the number of eosinophils and lymphocytes in the blood in addition to decreasing the output of T-cells and antibodies from the lymphoid tissue. Cortisol is an important component of the stress response although the mechanisms by which it is beneficial in this situation are still not fully understood. One possibility is that glucocorticoids cause a rapid mobilization of amino acids and fats which makes them immediately available for energy and for synthesis of other compounds . Ultimately, whether cortisol-induced effects prove to be adaptive or destructive depends on the concentration and length of cortisol exposure . Catecholamines Catecholamines are organic compounds of the adrenal medulla that function to increase cardiac output, elevate blood pressure, increase blood glucose levels, and promote an increase in blood lipids to prepare the body to take action in the “fight-or-flight” response . Epinephrine and norepinephrine are examples of catecholamines. Norepinephrine serves as a precursor for epinephrine and is the principal neurotransmitter released from the sympathetic nervous system . Adrenocorticotropic Hormone (ACTH) ACTH is released from the anterior pituitary and stimulates the secreation of adrenocortical hormones including cortisol, androgens, and aldosterone . Corticotropin-Releasing Hormone (CRH) CRH is released from the hypothalamus and causes the release of ACTH . All types of stress including psychological, emotional, physical, and neurogenic stress have been shown to be a potential trigger of ischemic stroke . Studies conducted on humans and in animals have documented that pre-ischemic exposure to stress is associated with impaired stroke outcome . Rodent models of stroke have also shown that mice exposed to restraint or social stress prior to experimental stroke developed significantly larger infarcts compared to the non-stressed mice . This research suggests the existence of a causal relationship between stress, HPA axis activity, and stroke outcome. Acute ischemic stroke is associated with increased activity of the HPA axis . Increased activity of the HPA axis results in increased cortisol production and pathologic sympathetic activation of the autonomic nervous system and elevated catecholamine levels . In the acute phase of ischemic stroke, activation of the HPA axis and pathologic sympathetic activation have been shown to aggravate cerebral ischemia and are related to poor functional outcomes . Elevated cortisol levels are also associated with stroke severity and are predictive of short and long-term mortality following ischemic stroke . A sustained increase in ACTH is indicative of possible HPA axis dysfunction as well and was also associated with a poor prognosis . Activation of the neuroendocrine system observed in the acute phase of stroke is also related to increased natriuretic peptides (NPs) . Natriuretic peptides are cardiac neurohormones that are involved in volume homeostasis and cardiovascular remodeling . They are synthesized mainly in the atrial and ventricular myocardium but can also be released from brain tissue, mainly the hypothalamus . Similar to the effects of HPA activation and increased cortisol on ischemic stroke, increased levels of NPs are also associated with poor functional outcomes and can predict long-term mortality following stroke . There are several mechanisms by which elevated levels of cortisol can lead to poor functional outcomes and increased mortality rates following ischemic stroke. Glucocorticoids such as cortisol, act to increase the ischemic injury to neurons, especially neurons of the hippocampus as it contains one of the highest densities of glucocorticoid receptors in the brain . The hippocampus plays an important role in the feedback regulation of the HPA axis . Therefore, its dysfunction could lead to elevated cortisol levels which would further exacerbate the existing brain damage and lead to a poor outcome . Cortisol also has the potential to initiate microglial proliferation and migration as they possess glucocorticoid receptors . Microglia are cells of the central nervous system that function as macrophages when they migrate to damaged CNS tissue and are likely sources of pro-inflammatory cytokines after stroke including TNF-α, IL-1β, IL-1α, IL-6, and NFκB . Therefore, the effect of cortisol on microglia can lead to a pro-inflammatory response which can increase the vulnerability of neurons to a neurodegenerative process, such as stoke, and result in increased stroke infarct volume . It has also been suggested that elevated levels of catecholamines and cortisol can result in myocardial damage which is related to increased short-term mortality rates following stroke . Another potential mechanism leading to poor outcomes and increased mortality rates involves increased NPs. Previous research has demonstrated that increased levels of NPs are associated with increased mortality in patients with a variety of cardiovascular diseases . Therefore, increased levels of NPs as a result of the increased neuroendocrine response in ischemic stroke can lead to poor outcomes and increased mortality in patients following stroke who also have a history of cardiac disease or dysfunction . It has also been hypothesized that activation of the NP system in ischemic stroke can cause a profound neurohormonal dysfunction that can worsen the long-term prognosis following stroke . High concentrations of NPs can directly stimulate cardiac pacemaking as well, suggesting that these peptides could potentially disturb autonomic cardiovascular control following stroke thereby leading to increased risk of death . Cortisol is a hormone released by the adrenal gland that is commonly used as a physiological marker of stress . An acute ischemic stroke is a stressful event that stimulates the HPA axis resulting in increased glucocorticoid levels . Research has examined the connection between cortisol levels and stroke. Several connections have been found suggesting that a prognostic relationship can be established between cortisol levels and functional outcome following stroke . Additionally, relationships have also been established between cortisol levels and mortality following stroke . In a 2010 study researchers found that following an acute ischemic stroke cortisol was increased compared to all other measured hormones . It also proved to be an independent prognostic marker of functional outcome and death within 90 days and at 1 year . Patients with lower functional outcomes and higher mortality rates experienced higher cortisol levels indicating higher degrees of stress . Serum cortisol levels have a proportional relationship with degree of stress and ultimately sroke severity . Cortisol levels increase with lesion size, neurological deficit, and clinical stroke syndrome . High cortisol levels in patients following an acute stroke can have secondary conseuqences contributing to lower functional scores and higher mortality rates . Patients with stroke and high cortisol levels have been shown to be more susceptible to adverse cardiac complications/events . This increased susceptibility to cardiac events leads to an increased mortality rate amongst patients who have had strokes with high cortisol levels . Additionally, higher cortisol levels influence mortality rates following stroke because of the hormone's effect on the immune system . Increased cortisol levels can lead to immunosupression leading to higher susceptibility for infectious disease . The increased susceptibility to infectious disease following an ischemic event leads to a worse prognosis . The central nervous system modulates activity of the immune system through a series of complex humoral and neural pathways including the HPA axis and sympathetic nervous system (Figure 6) . Stoke can lead to alterations in these pathways, thereby influencing the function of the immune system and vice versa . A complex relationship exists between acute ischemic stroke, immune function, and infection rates. Infections precede up to a third of ischemic strokes and can result in stroke through a range of potential mechanisms . Increased rates of infection are also observed following ischemic stroke and are linked to worse functional outcomes . Increased risk of infection and subsequent poor outcomes following stroke are related to immunodepression and autoimmunity . Preceding infections have been shown to increase the risk of stroke . It has been suggested that an acute infection can trigger stroke by inducing a period of heightened susceptibility through several mechanisms . One such mechanism is a change in the vascular endothelium from an anticoagulant to a coagulant cell layer resulting from increased peripheral concentrations of C-reactive protein and proinflammatory cytokines such as IL-1 and TNF-α associated with infection . This change results in a procoagulant state and is associated with increased risk of stroke . Another mechanism is the activation of machrophages and T-cells in atherosclerotic plaques during acute infection which increases the risk of plaque rupture resulting in stroke . Also, chronic infections may act to increase the risk of atherosclerosis and stroke by influencing traditional risk factors . For example, the introduction of an endotoxin to simulate an acute infection in rats induced stroke in those with pre-existing risk factors for stroke including hypertension, diabetes, advanced age, and a genetic predisposition to stroke but not in the rats without these factors . Immunodepression following ischemic stroke predisposes these patients to increased infection rates . These increased infection rates are related to the dysregulation of brain-immune interactions secondary to alterations in HPA-axis observed following stroke . This dysregulation is associated with increased plasma concentrations of circulating cytokines and a low ratio of pro-inflammatory TNF-α to anti-inflammatory IL-10 . Marked signs of suppression of cell-mediated immunity were also noted in acute ischemic stroke including functional deactivation of monocytes and T-helper type-1 cells . It has also been documented that this loss of function of T-helper cells persisted in those patients who did develop an infection post stroke . A loss of CD4+ T-cell function and increased IL-6 were noted in patients who developed an infection post stroke as well . Studies have also demonstrated that stroke can lead to an autoimmune response that contributes to the destruction of brain tissue at the site of the ischemic lesion facilitating worse functional outcomes . Following a stroke, ischemic compromise of the blood-brain barrier (BBB) allows for the infiltration of lymphocytes into the brain and leaking of antigens into the peripheral circulation . Both of these situations allow lymphocytes to encounter antigens which are normally kept apart by an intact BBB, potentially leading to an autoimmune response . In a series of studies conducted on rats, an inflammatory response following stroke initiated an innate immune response which set the stage for an adaptive immune response by creating an environment promoting lymphocyte sensitization to antigens . However, if one of these was a brain antigen, a CNS autoimmune response sometimes occurred which was associated with a worse outcome . Related to this, another study demonstrated that mice which cannot mount an adaptive immune response secondary to a genetic disorder had reduced early ischemic damage . Cytokines are proteins produced by most nucleated cells in response to injury and regulate the immune response in the body. Their numbers are usually undetectable in the brain; following ischemic stroke they proliferate in the brain tissue and damage neural tissue by activating and maintaining the immune response. Cytokines are subcategorized into different groups, including interleukins (IL), cytotoxic T cells, tumor necrosis factor (TNF), interferons, growth factors, colony-stimulating factors, and chemokines. These molecules play a complex role in the brain and body following stroke and act on and through many different cells. Their effects can be both positive and negative, and some of the exact ways they influence other cells is still unclear. Cytokines are responsible for much of the secondary damage that occurs in the brain following initial insult and play an important role in the inflammatory response that occurs both in the brain and systemically. Ischemic brain injury results in decreased lymphocyte numbers (especially CD4+) and impaired lymphocyte function in part due to cytokines such as IL-10, which negatively affects lymphocyte function. Levels of many of the types of cytokines are increased following ischemic stroke, including human leukocyte antigen (HLA-DR) expression by monocytes, the immunosuppressant IL-1ra (IL-1 receptor antagonist), and plasma levels of IL-10, IL-1ra and cortisol, while concurrent decreased production of tumor necrosis factor (TNF-a) has been shown. Since cytokines are also known to have a positive effect after stroke by helping fight and control infection risk, imbalance of the levels of various cytokines can increase the risk for infection following ischemic stroke. Many animal studies have been done to help understand the underlying cell biology mechanisms following stroke. Many of these studies focus on the focal and systemic effects of acute ischemic stroke and are the reason we understand much of what occurs in the brain and body following a stroke. Following unilateral damage to the sensorimotor cortex in rats through focal corticol ischemia, dendritic overgrowth occurs in Layer V followed by dendritic pruning, synapse formation, and changes in synaptic connections. GAP-43 and synaptophysin increase in surrounding tissue, suggesting axonal sprouting/axonal growth and an increase in the number of synapses, respectively. Several types of cytokines were also found to be replicating following a stroke signifying increased immune response, including increased numbers of mRNA tumor necrosis factor (TNF) alpha, interleukin (IL)-6, IL-1, and IL-3. Administration of D-amphetamine or norepinephrine enhances motor recovery, as well as nerve growth factor (NGF), basic fibroblast growth factor (bFGF), and osteogenic protein-1 (OP-1). Administration of N-methyl-D-aspartate (NMDA) receptor antagonists or ethanol can block the pruning process and disrupt recovery. Middle cerebral artery occlusion (MCAO)-induced stroke in mice resulted in atrophy of the spleen and thymus due to an initial severe spike in inflammatory cytokines followed by severe immunosuppression. Loss of CD4+ T cell activation contributes to this immunosuppression. Reduced levels in inhibitory GABAa receptors and increases in excitatory glutamate NMDA receptors occur in spared cortex tissue. Glutamate is the major neurotransmitter of the horizontal connections in the cortex and is implicated in functional reorganization of the cortex motor map. Glutamate release causes excitotoxicity in the brain through activation of NMDA and AMPA receptors, ultimately leading to neuronal cell death. MCAO-induced stroke has been shown to activate the sympathetic adrenomedullary pathway and increase risk for infection and death. Decreasing the inflammatory response by increasing anti-inflammatory factors such as IL-10 and decreasing pro-inflammatory cytokines such as MPO, TNF-a, and cytotoxic T-cells (specifically CD3+ and CD8+) following ischemic/reperfusion (I/R) injury can improve outcomes in mice studies. Many of the benefits achieved after increasing D-AMP, for example, are further improved when coupled with massed practice exercises to regain functions impaired or lost. As stated above, a stroke is the most lethal neurological disorder affecting adults today. The local and systemic effects that occur after a stroke, such as the immune response and excitotoxicity, have lasting effects on the amount of function and independence a person can regain after a stroke. It is paramount to understand the cell biology mechanics that occur prior to and following a stroke in order to mount the most effective response and diminish the subsequent injury to the brain and body following the initial insult. As pharmacokinetics and researchers are able to gain a better understanding of the exact mechanisms that occur throughout the cells of the body, such as with different cytokines, more effective responses can be discovered to manage and decrease the amount of injury. 2. Goodman CC, Fuller KS, Boissonnault WG. Pathology: Implications for the Physical Therapist, Second Edition. Philadelphia, PA: Saunders; 2003. 3. American Heart Association. Heart disease and stroke statistics-2004 update. Dallas, Tex: American Heart Association; 2003. 17. Graham D, Lantos P. Greenfield’s Neuropathology 7th ed. Arnold publisher; New York, NY. 2002. 19. Bornstein N. Stroke: Practical Guide for Clinicians. Karger Publishers. Switzerland. 2009. 20. Mohr J. Stroke: Pathophysiology, diagnosis, and management. Elsevier Health Sciences. Philadelphia, PA. 2004. 21. Beal MF (1992) Mechanisms of excitotoxicity in neurologic diseases. FASEB J 6:3338–3344. 22. Doble A. The Role of Excitotoxicity in Neurodegenerative Disease: Implications for Therapy. Pharmacol Ther. 1999; 81(3): 163-221. 23. Bano D, Young KW, Guerin CJ, Lefeuvre R, Rothwell NJ, Naldini L, Rizzuto R, Carafoli E, Nicotera P (2005) Cleavage of the plasma membrane Na+2/Ca2+ exchanger in excitotoxicity. Cell 120:275–285. 24. Nakka VP, Gusain A, Mehta SH, Raghubir R. Molecular mechanisms of apoptosis in cerebral ischemia: multiple neuroprotective opportunities. Mol Neurobiol. 2008; 37:7-38. 26. Xiong ZG, Chu XP, Simon RP (2006) Ca2+-permeable acidsensing ion channels and ischemic brain injury. J Membr Biol 209:59–68. 27. Lotocki G and Keane R. Inhibitors of Apoptosis Proteins in Injury and Disease. Life. 2002; 54: 231-240. 28. Kleinschnitz C, Grund H, Wingler K, Jones E, et al. Post-stroke inihibition of induced NADPH oxidase type 4 prevents oxidative stress and neurodegeneration. PLoS Biology. 2010; 8(9): 1-13. 29. Halliwell B, Gulteridge JMC. Free radicals in biology and medicine. 2nd Edition. 1989. Oxford, Clarendon. 30. Liu PK. Ischemia reperfusion-related repair deficit after oxidative stress: implications of faulty transcripts in neuronal sensitivity after brain injury. J Biomed Sci. 2003; 10:4-13. 31. Eliasson MJ, Huang Z, Ferrante RJ, et al. Neuronal niric oxide synthase activation and peroxynitrite formation in ischemic stroke linked to neural damage. J Neurosci. 1999; 19:5910-5918. 32. Chong ZZ, Li F, Maiese K. Oxidative stress in the brain: novel cellular targets that govern survival during neurodegenerative disease. Prog Neurobiol. 2005; 75:207-246. 33. Yamamoto T, Maruyama W, Kato Y, et al. Slective nitration of mitochondrial complex I by peroxynitrite: involvement in mitochondria dysfunction and cell death of dopaminergic SH-SY5Y cells. J Neural Transm. 2002; 109:1-13. 34. Kim GW, Kondo T, Noshita N, Chan PH. Manganese superoxide dismutase deficiency exacerbates cerebral infarction after focal cerebral ischemia/reperfusion in mice: implications for the production and role of superoxide radicals. Stroke. 2002; 33:809-815. 35. Murakami K, Kondo T, Kawase M, Li Y, et al. Mitochondrial susceptibility to oxidative stress exacerbates cerebral infarction that follows permanent focal cerebral ischemia in mutant mice with manganese superoxide dismutase deficiency. J Neuorsci. 1998; 18:205-213. 37. Image retrieved from http://journals.prous.com/journals/dot/20033901/html/dt390019/images/Kulkarni_f4.gif on February 12, 2011. 38. Chan PH. Reactive oxygen radicals in signaling and damage in the ischemic brain. J Cereb Blood Flow Metab. 2001; 21:2-14. 39. Mehta SL, Manhas N, Raghubir R. Molecular targets in cerebral ischemia for developing novel therapeutics. Brain Research Reviews. 2007; 54:34-66. 40. Huang J, Agus DB, Winfree CJ, Kiss S, et al. Dehydroascorbic acid, a blood-brain barrier transportable form of vitamin C, mediates potent cerebroprotection in experimental stroke. Proc Natl Acad Sci USA. 2001; 98:11720-11724. 41. Kilic U, Kilic E, Dietz GP, Bahr M. Intravenous TAT-GDNF is protective after focal cerebral ischemia in mice. Stroke. 2003; 34:1304-1310. 42. Tan, DX, Manchester LC, Reiter RJ, Qi WB, et al. Significance of melatonin in antioxidative defense system: reactions and products. Biol Signals Recept. 2000; 9:137-159. 43. Pei Z, Pang SF, Cheung RT. Pretreatment with melatonin reduces volume of cerebral infarction in a rat middle cerebral artery occlusion stroke model. J Pineal Res. 2002; 32:168-172. 44. McCulloch J, Dewar D. A radical approach to stroke therapy. Proc NAtl Acad Sci USA. 2001; 98:10989-10999. 45. Warner DS, Sheng H, Batinic-Haberle I. Oxidants, antioxidants and the ischemic brain. J Exp Biol. 2004; 207:3221-3231. 46. Love S. Oxidative stress in brain ischemia. Brain Pathol. 1999; 9:119-131. 47. Opitz N, Drummond GR, Selemidis S, et al. The 'A's and 'O's of NADPH oxidase regulation: a commentary on "subcellular localization and function of alternatively spliced Noxo1 isoforms." Free Radic Biol Med. 2007; 42:175-179. 48. Miller AA, Drummond GR, Schmidt HH, Sobey GG. NADPH oxidase activity and function are profoundly greater in cerebral versus systemic arteries. Circ Res. 2005; 97:1055-1062. 49. McCann SK, Dusting GJ, Roulston CL. Early increase of Nox4 NADPH oxidase and superoxide generation following endothelin-1 induced stroke in concious rats. J Neurosci Res. 2008; 86:2524-2534. 50. Motzer SA, Hertig V. Stress, stress response, and health. Nurs Clin N Am. 2004; 39: 1-17. 51. Chamorro A, Urra X, Planas AM. Infection after acute ischemic stroke: A manifestation of brain-induced immunodepression. Stroke. 2007; 38: 1097-1103. 52. Stuller KA, Jarret B, DeVries AC. Stress and social isolation increase vulnerability to stroke. Experimental Neurology. 2011; 1-7. 53. Guyton AC, Hall JE. Textbook of Medical Physiology. 11th ed. Philadelphia, Pennsylvania: Saunders; 2006. 54. McArdle WD, Katch FI, Katch VL. Exercise Physiology. 5th ed. Philadelphia, Pennsylvania: Lippincott Williams & Wilkins; 2001. 55. Makikallio A, Korpelainen J, Makikallio T, Tulppo M, Vuolteenaho O, Sotaniemi K, Huikuri H, Myllyla V. Neurohormonal activation in ischemic stroke: Effects of acute phase disturbances on long-term mortality. Current Neurovascular Research. 2007; 4: 170-175. 56. Fassbender K, Schmidt R, Mossner R, Daffertshofer M, Hennerici M. Pattern of activation of the hypothalamic-pituitary-adrenal axis in acute stroke: Relation to acute confusional state, extent of brain damage, and clinical outcome. Stroke. 1994; 25: 1105-1108. 57. Sander D, Winbeck K, Klingelhofer J, Etgen T, Conrad B. Prognostic relevance of pathological sympathetic activation after acute thromboembolic stroke. Neurology. 2001; 57: 833-838. 58. Marklund N, Peltonen M, Nilsson TK, Olsson T. Low and high circulating cortisol levels predict mortality and cognitive dysfunction early after stroke. J Int Med. 2004; 256: 15-21. 59. Levin ER, Gardner DG, Samson WK. Natriuretic peptides. N Engl J Med. 1998; 339: 321-328. 60. Makikallio AM, Makikallio TH, Korpelainen JT, Vuolteenaho O, Tapanainen JM, Ylitalo K, Sotaniemi KA, Huikuri HV, Myllyla VV. Natriuretic peptides and mortality after stroke. Stroke. 2005; 36: 1016-1020. 61. Antonawich FJ, Miller G, Rigsby DC, Davis JN. Regulation of ischemic cell death by glucocorticoids and adrenocorticotropic hormone. Neuroscience. 1999; 88: 319-325. 62. Bratt AM, Kelley SP, Knowles JP, Barrett J, Davis K, Davis M, Mittleman G. Long term modulation of he HPA axis by the hippocampus: Behavioral, biochemical and immunological endpoints in rats exposed to chronic mild stress. Psychoneuroendocrinology. 2001; 26(2): 121-145. 63. Venes D. Taber’s Cyclopedic Medical Dictionary. 20th ed. Philadelphia, Pennsylvania: F.A. Davis; 2001. 64. Christensen H. Serum-cortisol related severity and mortality in acute stroke. J Neurol Sci. 2004; 217:175-180. 65. Neidert S, Katan M, Schuetz P, Fluri F, Ernst A, Bingisser R, Kappos L, Engelter ST, Steck A, Muller B, Christ-Crain M. Anterior pituitary axis hormones and outcomes in acute ischemic stroke. Journal of Internal Medicine. Accepted 2010. 66. Samuels MA. The brain-heart connection. Circulation. 2007; 116:77-84. 67. Anne M. Neurohormonal activation in ischemic stroke: effects of acute phase disturbances on long-term mortality. Current Neurovascular Research. 2007; 4:170-175.: Vogelgesang2010 : Vogelgesang A, Dressel A. Immunological consequences of ischemic stroke: Immunosuppression and autoimmunity. J Neuroimmunol. 2010; 1-6. 68. Vogelgesang A, Dressel A. Immunological consequences of ischemic stroke: Immunosuppression and autoimmunity. J Neuroimmunol. 2010; 1-6. 69. Hedley CAE, Hopkins SJ. Acute ischaemic stroke and infection: Recent and emerging concepts. Lancet Neurol. 2008; 7: 341-353. 70. Ionita CC, Siddiqui AH, Elad LI, Hopkins LN, Snyder KV, Gibbons KJ. Acute ischemic stroke and infections. Journal of Stroke and Cerbrovascular Diseases. 2011; 20(1): 1-9. 71. Grau AJ, Urbanek C, Palm F. Common infections and the risk of stroke. Nat Rev Neurol. 2010; 6: 681-694. 72. Hallenbeck JM, Dutka AJ, Kochanek PM, Siren A, Pezeshkpour GH, Feuerstein G. Stroke risk factors prepare rat brainstem tissues for modified local shwartzman reaction. Stroke. 1988; 19: 863-869. 73. Worthmann H, Tryc AB, Deb M, Goldbecker A, Ma YT, Tountopoulou A, Lichtinghagen R, Weissenborn K. Linking infection and inflammation in acute ischemic stroke. Ann NY Acad Sci. 2010; 1207: 116-122. 74. Becker KJ. Sensitization and tolerization to brain antigens in stroke. Neuroscience. 2009; 158(3): 1090-1097. 75. Offner H, Vandenbark AA, Hurn PD. Effect of experimental stroke on peripheral immunity: CNS ischemia induces profound immunosuppression. Neuroscience. 2009; 158: 1098-1111. 76. Tuttolomondo A et al. Inflammatory cytokines in acute ischemic stroke. Current Pharmaceutical Design 2008; 14: 3574-3589. 77. Tanzi P et al. Post-stroke infection: A role for IL-1ra? Neurocrit care 2010. 78. Nudo R et al. Role of adaptive plasticity in recovery of function after damage to motor cortex. Muscle and Nerve 2001; 24: 1000-1019. 79. Elango C, Devaraj S. Immunomodulatory effect of Hawthorn extract in an experimental stroke model. Journal of neuroinflammation 2010; 7 (97): 1-13. 80. Stinear C et al. Priming the motor system enhances the effects of upper limb therapy in chronic stroke. Brain 2008; 131: 1381-1390. 81. Krugers HJ. The corticosterone synthesis inhibitor metyrapone prevents hypoxia/ischemia-induced loss of synaptic function in the rat hippocampus. Stroke. 2000; 31:1162-1172. 82. Craik R et al. Recovery processes: Maximizing function. 165-173. 83. Kes V et al. Pro-inflammatory and anti-inflammatory cytokines in acute ischemic stroke and their relation to early neurological deficit and stroke outcome. Clinical Biochemistry 2008; 41: 1330-1334.